No metal. No wires. Just a beautiful smile! Would you like to have your crooked teeth corrected? This modern-day orthodontic treatment helps align your teeth without braces. With a modern approach to straightening your teeth, you can enjoy the ease of these plastic aligners that slip right over your teeth, and right off when you want to eat or brush! 1. 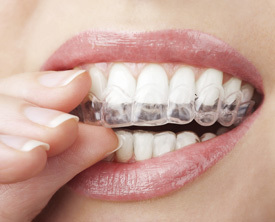 We use custom-molded, clear aligners that are created specifically for you. These aligners slide right over your teeth. 2. You will wear these thin aligners throughout your day and at night for several weeks before moving on to your next set. 3. Slowly and over time, your teeth align in the proper position to unveil an even straighter smile. Research shows that more than 1.3 million patients have used Invisalign® worldwide to meet their orthodontic needs. Invisalign® aligners are very comfortable and the fact that they are invisible and easily removable make them convenient orthodontic option. Over the course of about a year, you’ll be able to enjoy your favorite foods and maintain your normal lifestyle while your teeth align perfectly. Interested? Let’s set up a consultation to see if Invisalign® is right for you and discuss your insurance coverage. Say goodbye to braces and hello to a beautiful new smile! Call us at (631) 722-5478.